Authorities documented five cases in residence halls that officials determined were motivated by race, religion, ethnicity or sexual orientation bias, according to the annual security report. 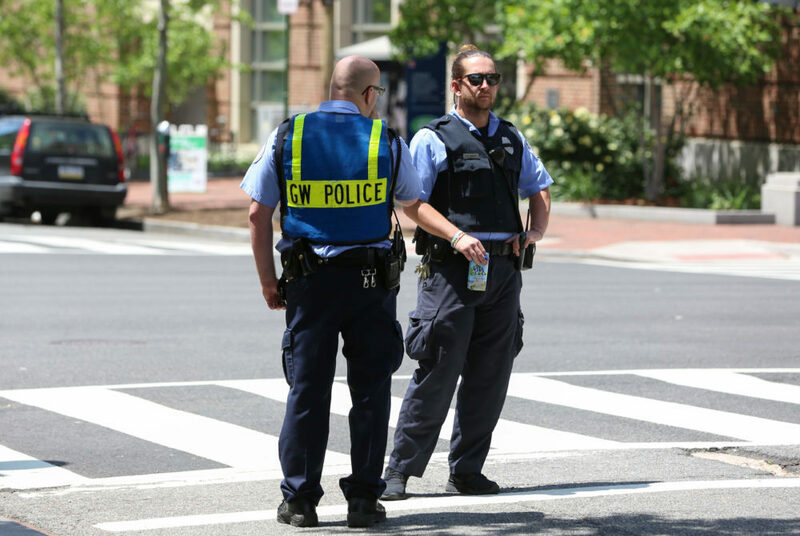 GW recorded five on-campus hate crimes last year – the most in at least five years. Authorities documented two cases of vandalism or destruction of property and three cases of intimidation in residence halls – all on the Foggy Bottom Campus – that officials determined were motivated by race, religion, ethnicity or sexual orientation bias, according to the annual security report released Friday. Darrell Darnell, the senior associate vice president for safety and security, said it is concerning any time such incidents happen on campus but didn’t give a specific explanation for the increase. “I think that to the extent that we can’t have a civil discourse and the fact that someone would do something like that is obviously concerning,” he said in an interview. The number of documented hate crimes rose last year from three in 2015, two in 2014 and one in 2013, according to recent security reports. Last year, two hate crimes were motivated by religious bias, one by ethnic bias and one by ethnic and racial bias. There was one sexual orientation-based hate crime documented in the report. Religious bias is the most common prejudice associated with those crimes, motivating 53 percent of all on-campus hate crimes reported in the past five years, followed by race and ethnic bias. Darnell said he did not want to speculate on the reasons why the number of reported hate crimes has risen. “If someone comes walking down the street on campus, then there’s nothing I can do about that, but if someone sticks a poster up in our building, you’re defacing our property and that’s a crime, so we could arrest someone for that,” he said. In the past year, several discriminatory fliers have been found on campus. In April, white nationalist posters promoting a “white nation” and labeling undocumented citizens as “criminals” appeared on campus and last month, Islamophobic fliers were posted in several places on campus and made to appear as if they were from GW’s chapter of the Young America’s Foundation. In 2015, three swastikas were drawn on the walls of International House, sparking an investigation and concerns about student safety. One student, who posted one of the swastikas as the Hindu symbol for success, was suspended from GW and expelled from his fraternity Zeta Beta Tau. Nearby American University has faced several incidents of racial hate on its campus in recent months. On the opening day of American University’s Anti-Racist Research and Policy Center last week, Confederate flags and cotton branches were posted around the school, the Chronicle of Higher Education reported. Last spring, on the day the first female African-American student body president took office at American, bananas were found hanging by nooses, an incident former University President Steven Knapp condemned. Over the past year, 154 hate speech incidents have occurred on more than 120 college campuses, many involving racist flyers or graffiti and many evoking the name of campaign slogans of President Donald Trump, according to a report by Buzzfeed News. Out of GW’s 14 peer schools, eight had available data for the number of hate crimes in 2016. American reported the highest number of cases at six on its main campus, while Georgetown reported four incidents, according to their annual security reports. In the District as a whole, the Metropolitan Police Department reported 107 hate crimes last year, the most since at least 2011, according to MPD’s website. One study by the Center for the Study of Hate & Extremism at California State University, San Bernardino found that hate crimes in major cites rose 20 percent in 2015, driven by passions during a heated presidential election. It is unclear whether there has been an increase in the amount of incidents or the amount people who are reporting at universities, but experts said hate crimes have become a more prominent topic of conversation on campuses. Steve Wessler, a human rights advocate who trains colleges on how to prevent biases, said with a more divided country and tense political climate, he would expect the data to show increases, but there is not enough reported data to support a clear trend. Wessler added that universities should train students to intervene when hateful comments are made. “If the campus is quiet and they don’t respond to these incidents, then the impression to the people who say these things or do these things is that everybody believes that what we are saying is acceptable,” he said. Edward Dunbar, a psychology professor at the University of California, Los Angeles who created a training for mental health staff for assisting victims of hate crimes, said in the past five or six years, more alt-right groups have increased their activities on campuses, which could cause a rise in hate crimes. Dunbar added that universities may be hesitant to publicize hate crimes to avoid increasing concerns about campus safety. Jackie Torrez and Pann Myat Phyu Sin Myo contributed reporting.